Openshot Video Editor created by Jonathan Thomas, forever changed the way people think about Linux when they are into video editing. 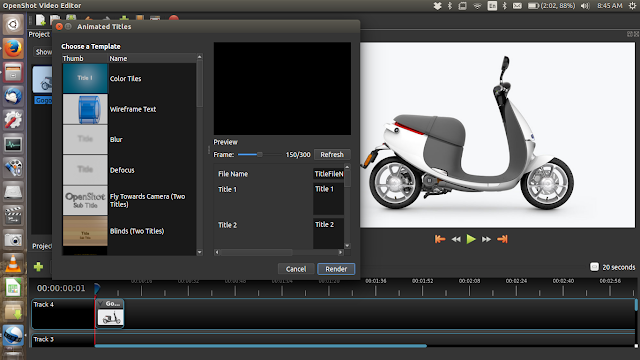 There were no reliable video editing apps available on Linux. With the effort of Jonathan Thomas now the professional video editing app Lightworks also developed it's award winning application of Linux. After being pledged $45,028 out of $20,000 target on kickstarter and after long time of 3 years in making Openshot 2.0 is finally released on January 11, 2016 not only for Linux but for Mac OS and Windows also meaning its cross platform. That is what the goal of Jonathan Thomas's kickstarter campaign aimed to deliver. You can easily download and run Openshot for Mac OS here and Windows here but little tricky for Linux. So, here is how to install Openshot 2.0.6 in Ubuntu Linux 14.04 or above. We have to use PPA for installing it so here is how we add and install it into our system. Openshot 2.0.6 is made on Qt and it's release note is here.